The Compact Reconnaissance Imaging Spectrometer for Mars (CRISM) took this observation of part of the Nili Fossae region at the western margin of the Isidis impact basin at 3:07 (UTC) on December 12, 2006, near 21.9 degrees north latitude, 78.2 degrees east longitude. The image was taken in 544 colors covering 0.36-3.92 micrometers, and shows features as small as 18 meters (60 feet) across. The image is about 11 kilometers (7 miles) wide at its narrowest point. The Isidis basin resulted from a gigantic impact on the surface of Mars early in the planet's history. 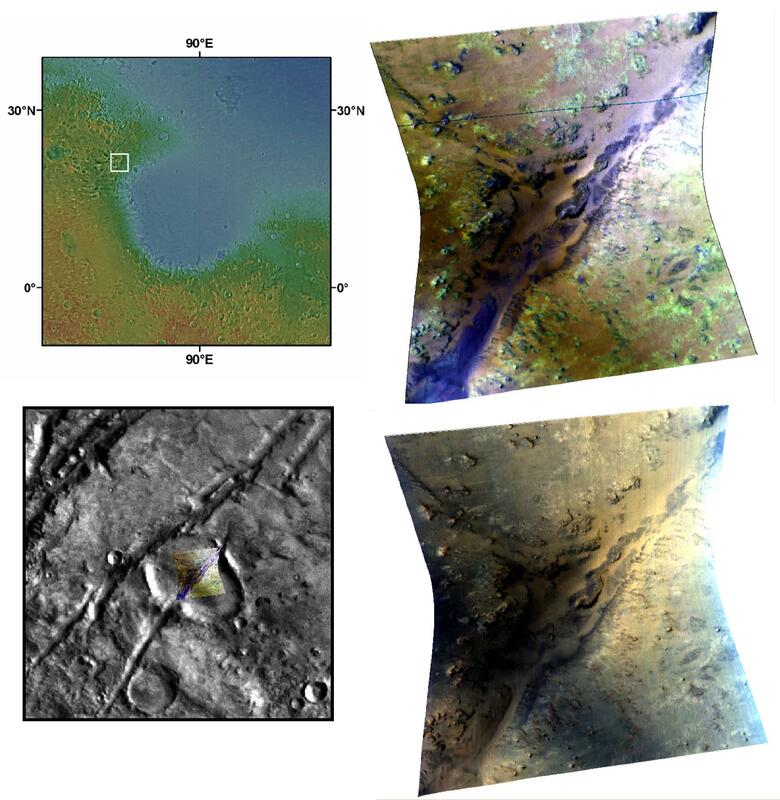 The image of the Isidis basin at the top left is the colored elevation data from the Mars Orbiter Laser Altimeter (MOLA) overlain on a digital image mosaic from the Viking mission. Reds represent higher elevations, and blue lower elevations. The western rim of the Isidis basin has numerous, concentric troughs (or "fossae") which may have formed during faulting associated with the impact event. Since then, the Nili Fossae region has since been heavily eroded, and is one of the most mineralogically diverse spots on Mars. This CRISM image targets one of region's smaller fractures. The image is shown overlain on the Viking digital image mosaic at lower left. The lower right CRISM image was constructed from three visible wavelengths (0.71, 0.60 and 0.53 microns in the red, green and blue image planes, respectively) and is close to what the human eye would see. The blue on the right of the image is an artifact from light scattering in the atmosphere. The upper right image was constructed from three infrared channels (2.38, 1.80 and 1.15 microns in the red, green and blue image planes, respectively) to highlight the mineralogy of the area. The bright green areas are rich in "phyllosilicates," a category of minerals including clays. The purple material along the walls of the fracture likely contains small amounts of the iron- and magnesium-rich mineral pyroxene. The yellow-brown material contains the iron- and magnesium-rich mineral olivine. Olivine and pyroxene are minerals associated with igneous activity. Overlaying CRISM data with images from the High-Resolution Imaging Science Experiment (HiRISE) camera shows that the phyllosilicates are in small, eroded outcrops of rock. The olivine is most abundant in sand dunes on the surface. The use of these two instruments together reveals more about the history of the region: Olivine sands covered the area shown in the image after the interaction of water and rock formed the phyllosilicates and after the fracture formed.